The Japanese carmakers continue to remain strong players in the industry, but are suddenly facing a very aggressive Korean machine. For the first time since The Car Guide’s very first award ceremony, our team has decided to offer our winners a custom-built trophy to underline the outstanding achievements of an ever-changing industry. Furthermore, it was important for us that the Canadian automotive industry’s most prestigious award would underline Québécois culture, ingenuity and its devotion to quality products. This is why our trophy was handcrafted by none other than Protocole – Trophies of Exception, a company born out of the artistic mind of Jean-Phillipe Caron, who also happens to have crafted the trophy for the Formula 1 Canadian Grand Prix. This prestigious distinction was the perfect fit for our business, and we are proud to offer his creation to our winners. These trophies have been distributed to the winners of 27 categories, as well as well as the Best New Design of the Year, the Best New Technology of the Year, the Best New Car of the Year and the Best New SUV of the Year 2019 awards. 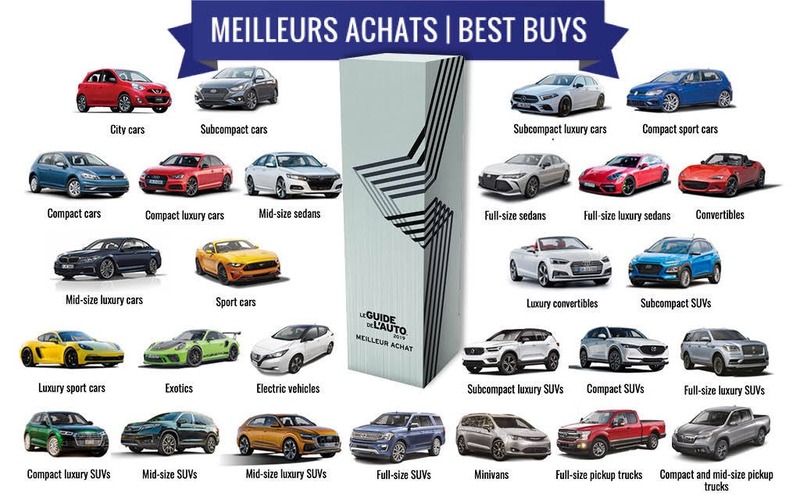 The Best New Car of the Year award is never published in our book, Le Guide de l’auto. It’s always revealed during our ceremony in the fall. Of course, we’ll publish a detailed article shortly explaining why that specific car won first place. This year, the honour goes to the 2019 Mercedes-Benz A-Class, a subcompact luxury sedan and hatchback that surpassed our expectations in terms of design, technology, sophistication and value. JoAnne Caza, Director of Communications and Public Relations from Mercedes-Benz Canada was there to receive the trophy. The SUV segment cannot be neglected as it currently represents the largest market share for an entire industry worldwide. With so many excellent players from all categories, choosing a winner was a difficult task, but things became clearer after our trip to California where we drove the all-new 2019 Hyundai Kona Electric this fall. Thanks to, yes, it’s fully electric version, but also the gasoline-powered model which surprised us for its styling, ingenuity, practicality and value, the 2019 Hyundai Kona was a no-brainer choice for the Best New Sport Utility Vehicle of the Year title. Jean-François Taylor, Product and Public Relations Specialist from Hyundai Canada, was at the event to receive the award. Once again, the German brands proved dominant at this year’s awards ceremony. Volkswagen went home with the Best Buy award in the compact car category with the Golf. Porsche won the Best Exotic Car award with the 911, and Audi won both the compact luxury SUV award with the Q5 as well as the midsize luxury SUV award with the Q7 and Q8. A special mention must also be made to Volvo for winning the Best Luxury Subcompact SUV of 2019 with the XC40. Mazda also has something to be proud of for winning both Best New Design of the Year and Best New Technology of the Year for its Vision Coupe concept and the SKYACTIV-X engine technology. The Car Guide is proud to underline the technological progress of an automotive industry that has never been so vibrant and diversified. In the following weeks, we’ll be publishing detailed articles on our website explaining the winners of each category.